Percy Waters was one of the great tattooists/suppliers in the history of our business. Over the years he produced machines with many different frame designs and in his catalog he offered a full line of supplies. Waters was an old-school supplier and the machines that he offered were set-up to operate with connector cords. If you look at photographs of tattooists working in the early 1900s, you will notice a mass of wires on their work stands. These wires connected the machines to their power supply. The clip cord had not been invented yet, so each machine had it own cord. As with most suppliers of his era Waters offered several "starter kits" which were called "outfits" at that time. The top of the line of Waters' "outfits" was his Professional Tattooing Outfit, which included 4 machines, switchboard, 8 - ½ pound bag of red, brown, green and yellow, a pint of liquid pearl black ink, an instruction booklet, 20 sheets of colored flash, foot switch, cord, a sheet of celluloid and a stencil cutting tool. An $89.25 value for only $85.00! From the Professional Outfit it went down to the Compacted Outfit for $25.00, then to the Economical Outfits at $9.75 and $19.50, the Amateur Outfit at $6.00, the Beginners at $5.00 and finally his Hand Tattooing Outfit starting at $1.50. The basic hand outfit included one set of hand needles, a jar of red and black ink and a sheet of designs. Waters sold so many "outfits" that he started having to number them in his promotional materials; he must have run out of names! 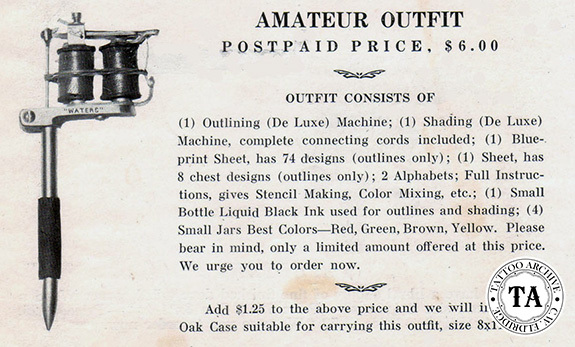 The Amateur Outfit that Waters sold included an outlining and shading machine that he described as the "Deluxe." This was an interesting frameless machine that we have never seen, except in an illustration. The whole top end of the machine (back spring mount and contact point) is mounted off the top of the coil cores. From the illustration in Waters' flyer it is hard to imagine how the connector cords are hooked up to this machine, there are no visible connectors. We would like to thank Aaron Coleman for his great illustration of the Deluxe machine.